Ok people, clean your damn cars. I mean OMG, you eat in there all the time. A new study from CarRentals.com has found something disgusting about our rides. The first thing is that 32% of the people surveyed only clean their cars once per year. The study found that 20% of drivers eat in their car on a weekly basis. Here’s the kicker people – get ready to hurl. The study found that your steering wheel is six times dirtier than a cell phone screen. It’s two times dirtier than public elevator buttons, AND your steering wheel is four times dirtier than a public toilet seat. Apparently handling fuel pumps doesn’t help; they are cesspools of germs. Germ levels are measured in CFUs, and while typical public locations have levels in the hundreds of CFUs – those public toilet seats measure 172 CFU for instance – a gas pump handle typically measures in the millions of CFU. Someone must be literally ramming the pump handle up their arse to get levels that high. I’m going to start going to full-service gas stations right now. 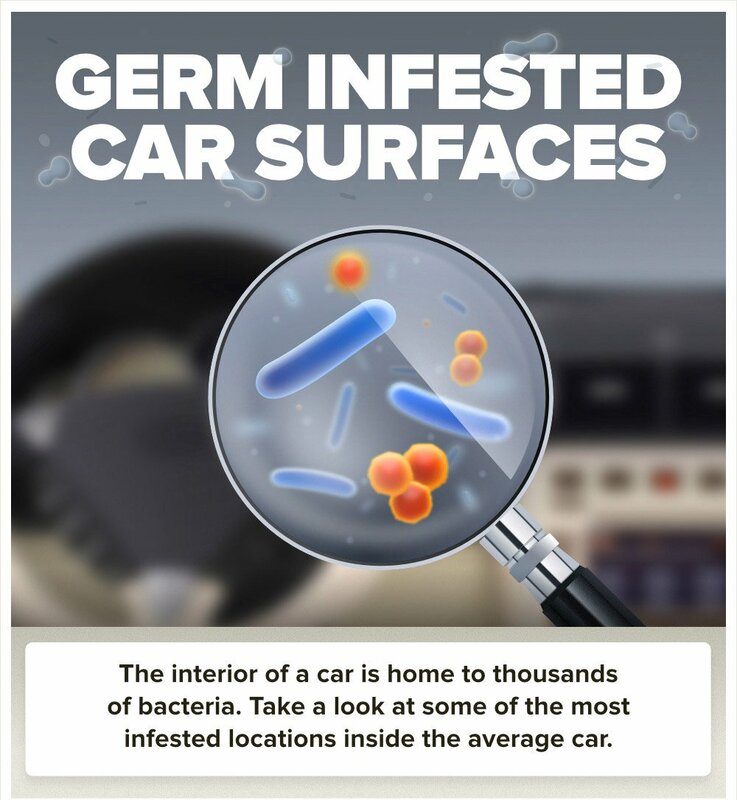 The infographic below sums up some of the many nasty facts about the germs lurking in the average car, along with tidbits on gas pumps, rideshare cars, and more. Yuck.